11 Aug The Magic Continues! 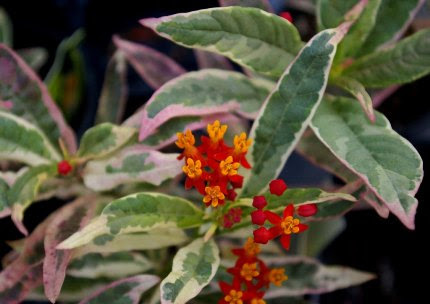 Asclepias ‘Monarch Promise’ is a beautiful tropical milkweed with variegated leaves and brilliant flowers. This is the perfect larval food plant to grow in a container. It’s a nectar flower too! how we raise them, and teach you how to grow the plants that they need in your gardens. It’s easy! Even if you only have a deck or a small patio, you can fill your container gardens with larval food plants (to grow the eggs into caterpillars) and nectar plants. Butterfly bushes are real action plants! moths all on the butterfly bush blossoms. Lately I have been copied on a few articles that say butterfly bushes are bad. 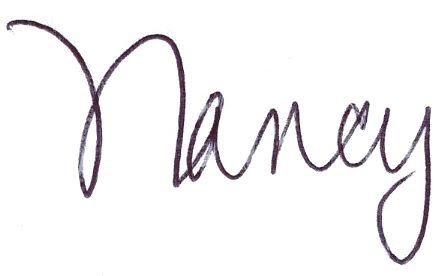 Nonsense. The reason for this statement is that in warmer states than ours they can self sow and be a nuisance. Here in CT, we have had cold enough winters that many of our butterfly bushes simply DIED. What few seedlings I see (some years there are some, mostly from my white plant), they are easy to spot and easy to pull out. Yes, I agree that the butterfly bush isn’t a larval food plant for butterflies. So what? It is an attracts so much life to the garden, it is often the first plant new gardeners have success with that makes them see the miracles of nature in their own back yard. 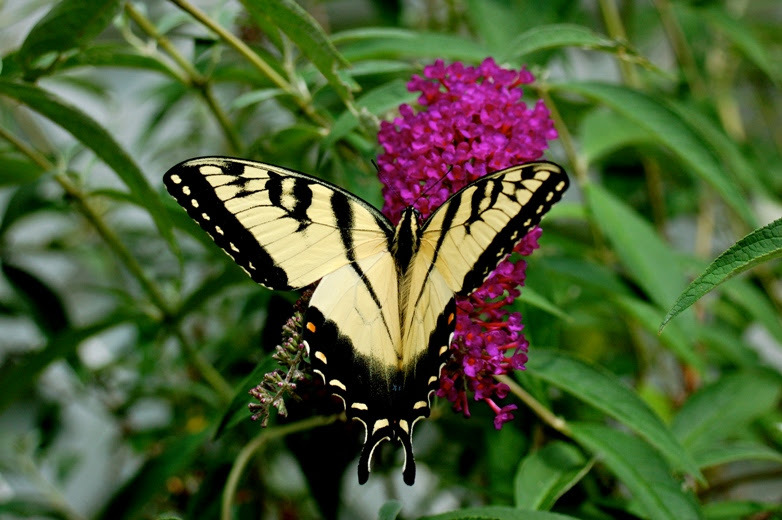 There are now sterile cultivars of butterfly bushes if self-seeding is an issue for you. 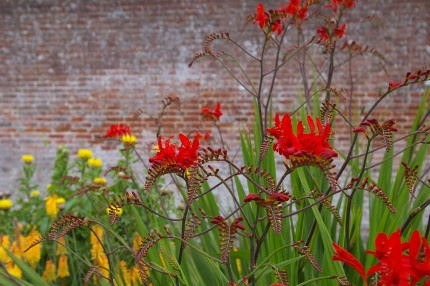 Crocosmia ‘Lucifer’ is one of my favorite cut flowers. 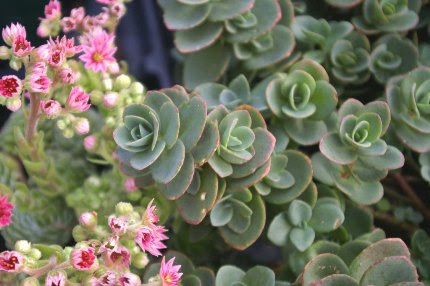 It is also an action plant as it is irresistible to hummingbirds. We have big, lush plants in stock this week. 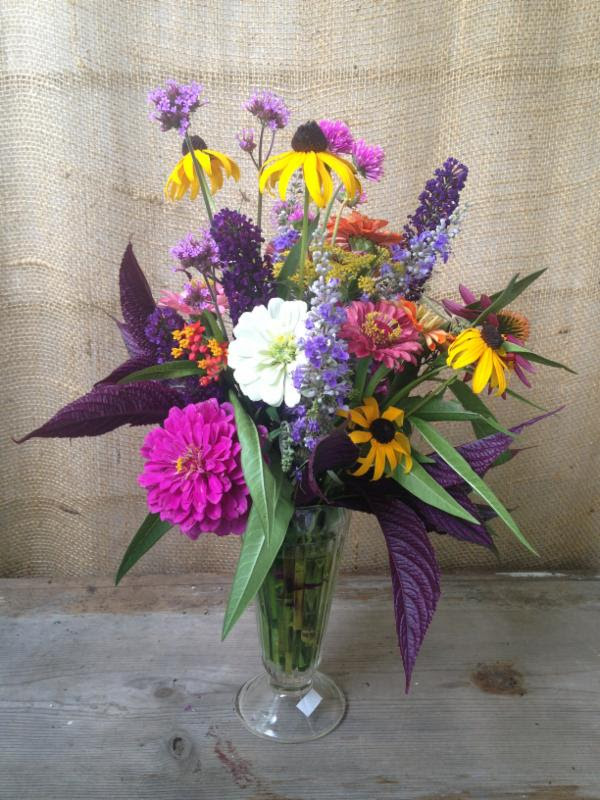 This is the “sweet treat” vase of flowers we will be creatingSaturday in our Have Fun with Flowers monthly workshop. how to condition and arrange flowers, I will open your eyes to the many flowers that you can grow right in your own back yard for butterflies AND for cutting. Ever since I began these flower arranging workshops, the participants have shared with me that they now cut and arrange all the time. So do I. I collect vases of all sizes and shapes. I place fresh flowers on my writing desk, in the guest bathroom, and on the dining room table. It is a way to study the flowers up close and honor the beauty that you have created. This week we received a HUGE shipment of Second Season organic vegetable seedlings. I spent all day Sunday and part ofMonday in my garden. I planted lettuce seeds and plants, escarole seeds (and soon the plants), zucchini squash, and pole beans. I will snag a few more trays of assorted veggies. What? For anyone new to growing food, you may wonder what I am doing planting vegetables in August. This is called the Second Season- I am planting for fall harvests. You can too. Beans, beets, broccoli, broccoli raab, Brussel sprouts, Chinese and red cabbage, cauliflower, endive, escarole, frisee, Florence fennel, dandelion greens, Swiss chard, mesclun, Pac choi, Tatsoi, baby turnips, scallions, kale, and lettuce are all good choice for right now. Many can be planted from both seeds and plants to extend the harvest. Others (broccoli and Brussel sprouts for example) should be planted as already started seedlings at this time of year. We want you to have a gourmet fall. 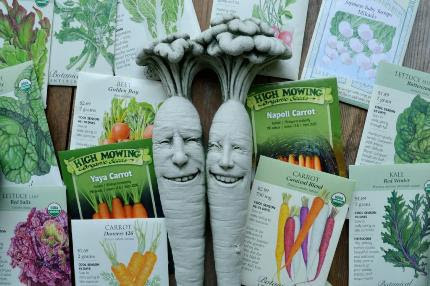 Try some new crops that you haven’t grown before. Discover, as we have, the thrill of going out into your garden in late October and picking fresh greens and pulling crisp, sweet root crops out of the ground. If you don’t know how to do it, just ask one of my staff members. We all grow food and we have a LOT of food growing right in our parking lot, affectionately nicknamed Veggie Island. We harvest and give that food away. Monday I ate freshly dug red potatoes and delicious yellow squash that I brought home from work. Keep planting and have a gourmet fall! Have you noticed a striking purple flower blooming in open fields all along the side of the road in the past few weeks? That is ironweed (Vernonia noveboracensis), a wonderful native perennial that grows to mammoth proportions in my borders at home. I love this plant and so do the butterflies and bees. Not everyone has the room for a 6-7′ tall purple perennial in August. 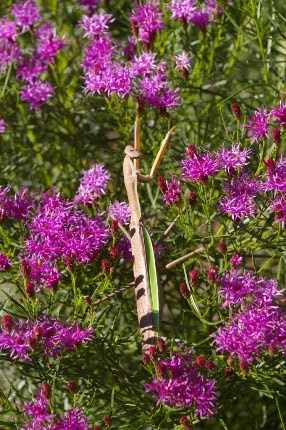 Vernonia ‘Iron Butterfly’ in my garden with a praying mantis posing for the camera. No worries! Try Vernonia lettermanii ‘Iron Butterfly’, a compact, shorter variety of ironweed that has feathery, delicate foliage and blooms for 4-6 weeks with the same deep purple flowers. It is budding up now and blooms a bit later and a lot longer than its taller cousin. There are plants for every yard, for every purpose, for every condition imaginable. If you are on a well and can’t water a lot, you can grow Sedums, Russian sage (Perovskia) and yarrows (Achillea)- they love dry conditions once established. If you have dry shade, you can grow Carex grasses, bottle Gentians, hostas with fragrant flowers or glowing golden foliage, and bigroot geraniums (Geranium macrorrhizum) with scented foliage and bright pink flowers. I spend a lot of time at this time of year staring at my gardens and studying them. I am looking for gaps in color or places they seem to be crying out for something new. In one end of my main perennial garden, I have too many daisy type flowers together. As pretty as they all are, they need the contrast of big, bold, rounded flower shapes or rich, colorful foliage. I added a ‘Strawberry Vanilla’ tree hydrangea to that spot last year and that makes a huge difference. Now I am eyeing burgundy leaved Physocarpus ‘Little Devil’ to complete the picture. I am also starting to write down a few notes about plants to rearrange and divide in early October. You should too. August is a great month to sit, watch all the life in your gardens, and contemplate your successes and future plans for improvement. Stay tuned, we will be having a free Saturday morning workshop in the fall to help you with this process. Look at the petals of this “spoon” daisy mum. 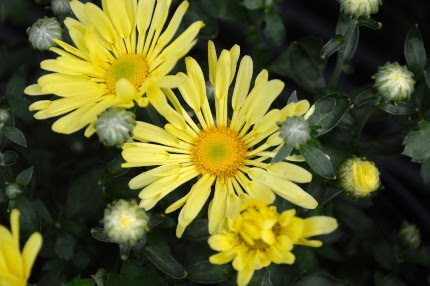 It is Dendranthemum ‘Mammoth Yellow Quill’ and it is a very hardy, very early, long blooming perennial mum. This is one of my favorite cut flowers to plant for late August and September harvesting. 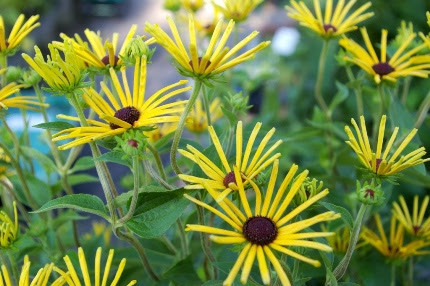 Rudbeckia subtomentosa ‘Henry Eilers’ also has spoon petals. The plant in my garden at home is in full bloom, with armloads of flowers that I will be cutting for the workshop on Saturday. monarch butterfly workshop this Saturday morning. It’s free and you don’t have to register, but get here early for a good seat. Sign up today for Have Fun with Flowers- the class is limited to 8 students- bring a couple of friends and you will be hooked.